We began our winter discussions today. We talk about the type of weather that occurs in the winter, what are some fun things to do in the winter, what happens to the water in the winter, and what do you wear in the winter. 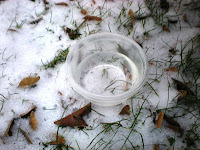 Our first activity today was to discuss what happens to water in the cold. We filled a little container with some water and placed it outside. When we go back to school we will go get it and see what happened--hopefully it will be ice by then. On Thursday, we will put the ice with some other ice cubes in the water table and see what happens when the ice gets warm. Fun project, but cold on the hands. Next we talked about the snow and sledding, skiing, making snowmen, snow angels, snow forts, etc. The list goes on and on. 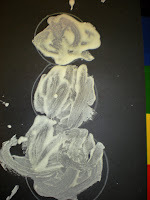 For our project we painted snowmen. In recent years I have just been using white paint. 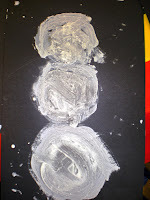 Many years ago, I loved using Ivory Snow powdered laundry detergent to make white paint for the snowmen. I have had trouble finding Ivory Snow powder as of late, but I found it the other day, so this year we painted with Ivory Snow paint. Put the two ingredients together in a bowl and mix. 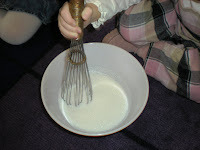 (We used a wire whisk). 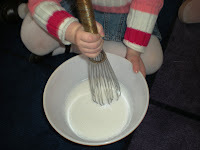 After the ingredients are mixed you can paint. When I finished mixing the two items together I wasn't too satisfied with the consistency of the "paint". I just kept adding Ivory Snow until I got a consistency I was happy with. It was probably somewhere around 2-2 1/2 cups of Ivory Snow. I didn't use any extra water. The children all helped me mix the paint up. With the recipe above I got just enough paint for the 14 children to paint large snowmen. 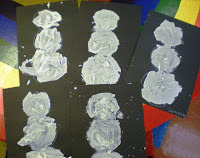 After the paint dried, which wasn't too long, the children enjoyed feeling the texture of the snowmen too. It was different from regular paint. We got a little messy, the paint tends to harden on the brushes and bowls too, but I was very pleased. The snowmen came out so cute with some texture and some po p off the paper. When we go to school on Thursday we will empty our closet and decorate the snowmen with all kinds of "stuff". I love seeing all the different snowmen you can get. 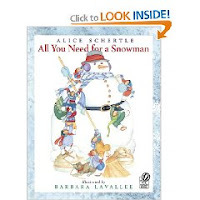 Here is the book we read today: "All You Need for a Snowman," by Alice Schertle, illustrated by Barbara Lavallee. 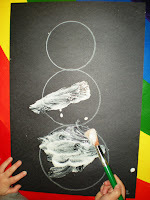 It is a basic book, but the children think it is so cute how the children in the book build their snowman. The kids love to guess what else the snowman needs. I like the idea of the textured paint! Hi! Reviewed your blog few minutes back. This project, as usual, is also interesting. I love Ivory Snow paint but have also had a hard time finding the powder. Where did you find it? !